Dental-related stress is very EASY to control with hypnosis. Listening to this CD will put your mind at ease and help you become a more calm, centered person in the dental chair. Dr. Steve G. Jones M.Ed. is a clinical hypnotherapist who has developed a program just for those who fear the dentist. 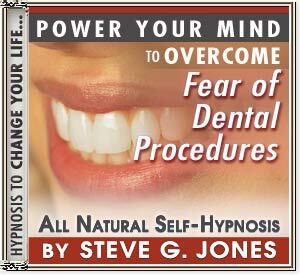 “Overcome Fear of Dental Procedures,” uses hypnosis to first relax and then reassure those who are facing dental procedures with anxiety and fear. In just three weeks, a new prospective on the dentist can be had through hypnosis. Let this hypnosis CD change your life!!! Positive suggestions for change will go to your subconscious mind EASILY and EFFORTLESSLY as you listen to this CD at night. ...just to name a few!!! !